Omara commences her Omara Portuondo 80th Birthday Concert Tour on September 23rd in Ciudad Juarez, Mexico. The tour will pass through Mexico, Colombia and the United States. In total there will be 15 concerts in just over a month. While in U.S., Portuondo will come back to the mythic Carnegie Hall in New York, this time will be as a spaecial guest of the African singer Angelique Kidjo. In mid-November Omara and Orquesta Buena Vista Social Club® will tour together in Europe for the second time this year. 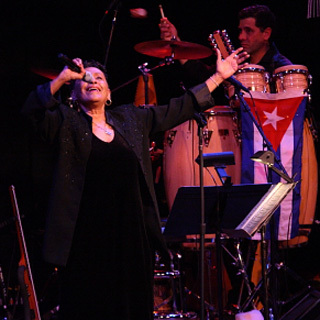 Austria, France, Switzerland and Spain will be the countries the Cuban musicians will visit featuring the famed Orquesta Bueana Vista Social Club® Featuring Omara Portuondo. December will bring together to the stage Omara Portuondo and David Murray, introducing the latest project of the American saxofonist, David Murray Cuban ensemble plays Nat King Cole en español featuring Omara Portuondo. To see all the concert dates of Omara click here.